The Ghost Is Clear Records - Puig Destroyer 7in. It started out as a quick idea (joke) by co baseball authors and musicians Riley Breckenridge (Thrice) and Ian Miller (KWC) to do a grind band based on new baseball phenom Yasiel Puig. It quickly turned into a musical project that would get the attention of baseball and heavy music fans within 10 days of its conception. Riley and Ian are joined by Jon Howell on guitar (Tigon, KWC) and Mike Minnick (Curl up and Die) on vocals. This seven inch was written and recorded via email with ideas bouncing back and forth that led to Scott Evans production of the 6 song 6 minute seven inch to blister your ears. Mike Minnick's vocals will take you back to unfortunately were not robots with rileys programmed chaos anchoring the KWC shred duo. The Ghost is Clear is proud to bring you all the distortion, digital blast beats, line drives and home runs that this thing has to offer to 45 rpms. 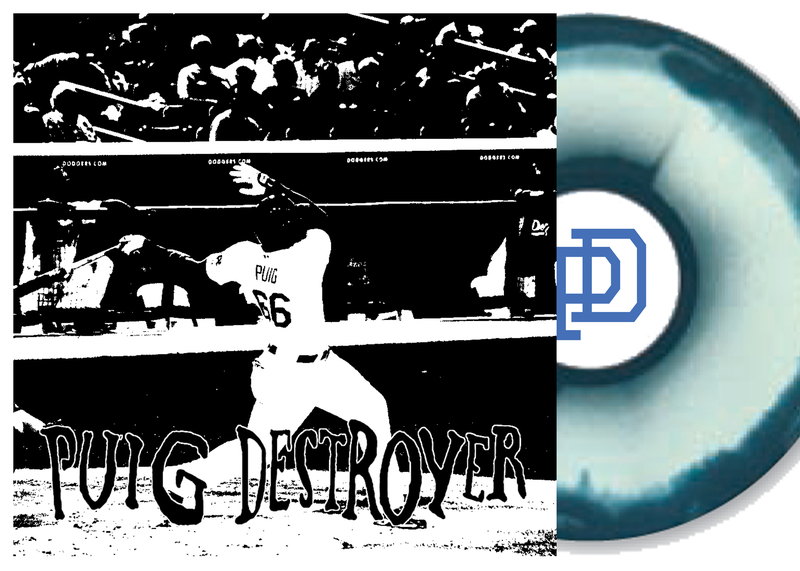 THE REPRESS NOW features aside/bside coloring, dodgers blue/bone (louisville slugger) color. NOTES on REPRESS: expected to Ship out ~Nov. 10th, limit of 2 vinyl per cart, we have to limit this due to the ebay scoundrels. The picture of the aside/bside colored vinyl is an example of approximately what it will look like.